In India, bhaen or kamal di dandi (lotus root) are available most times of the year and in the Punjab, it is prized for its crunchiness and highly fibrous texture which allows it to be made dry or curried. 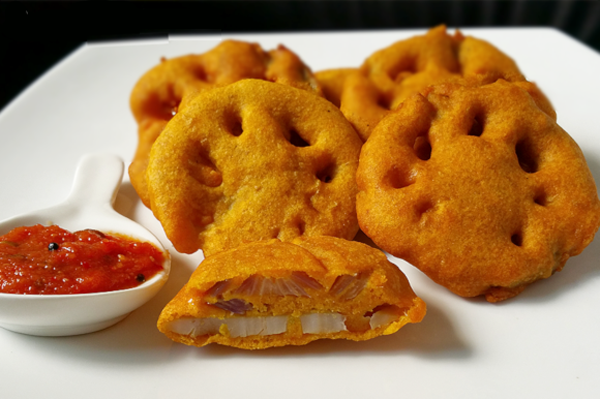 You can even make bhaen pakore (fried fritters) and though it is not a common ingredient, the results are delicious. The lotus flower is a divine symbol in Hinduism and many other Asian cultures, representing purity and non-attachment. Vishnu and Lakshmi are often portrayed on a pink lotus, and the Goddess Sarasvati is portrayed on a white lotus. Ganga and Ganesh are also often depicted with lotus flowers as their seats. In politics, the BJP uses the lotus as its symbol and in Indian civilian awards Padma Sri and Padma Bhushan, the word Padma means lotus. The lotus root is found underwater and can grow to a length of four feet. It is reddish brown with a white interior that is lacey, and has a texture that is slightly crunchy and mildly sweet. The lotus root is rich in dietary fiber, vitamin C, potassium, thiamin. Riboflavin, vitamin B5, phosphorus, copper and manganese and is low in saturated fat. The Indian variety is smaller and tastier than the Chinese variety which is bigger but also more porous and less crunchy. They have to be thoroughly washed as the roots have lots of dirt on them. Pakore are simply chickpea flour batter covered vegetables, but many people experiment with other edible items to dip and fry. Punjabi kaddi tastes best when made with plain pakoras rather than those with vegetables in them. And then there are the little pakodiyan (chickpea flour drops) that are plain and used in raita. Chickpea flour is also called besan and come from dry roasted garbanzos (or chickpeas) which is then ground. It is high in carbohydrates, but contains no gluten and has a higher protein content than other flours. 1. Wash the bhaen thoroughly to remove all the dirt off them then cut the stalks into 2 inch long pieces and place in a pot of water. Bring them to a boil for 10 minutes. 2. Drain the water and let the bhaen cool down then cut a slit half-deep into them lengthwise. 3. In a small bowl, mix all the spices together and keep to the side. 4. Now, take a pinch of the spice mixture and spread it into the slit in the bhaen and keep all the spiced pieces in a bowl. 5. In another bowl, pour in the besan, water, namak, mirch and ajwain and mix till it becomes a soft, running paste. For best use, the paste should not be too thin or too thick. 6. Heat the oil in a karahi (wok). Throw in a small dab of batter to make sure the oil is very hot. Take a piece of spiced bhaen, dip it into the batter to coat well, then release it into the hot oil. Keep doing this till the surface of the oil is covered with battered pieces. 7. When one side is slightly brown, turn it over using a sieved spatula and turn over a few times to make sure both sides are cooked. Be careful that they do not become dark brown. Take them out and place on a paper towel to absorb the extra oil. Lotus root is a very hard vegetable, though the stalk is hollow with many cavities that run the whole length. Though it can be easily cut into pieces, it is important to thoroughly clean it under running water to get out all the dirt that the roots grow in ponds. Some people try to sauté the roots directly in a skillet but they only become hard and inedible. Lotus roots need first be boiled into order to soften them. Some people cook the roots in the pressure cooker but you risk overcooking and making the pieces very tender and mushy that fall apart. It is best to boil them in a pot of water and then checking periodically that the pieces have become tender.